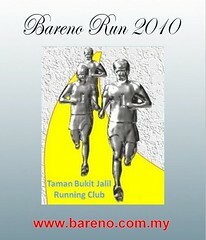 There were two reasons for me signing up for the Bareno Run (which was concluded two weeks back). Firstly, I had only done one race this year ie. 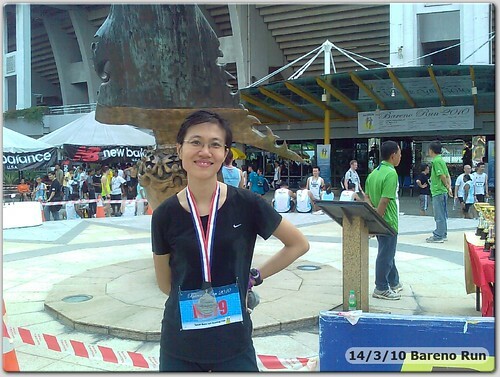 the Putrajaya Night Run last month (Feb) and my running goal for this year is to enter one race per month. With no race in January, I’m one race short. Secondly, this event has both the 10K and 5K races and since waiyan does the 5K, it’s a good opportunity for both of us to run together. 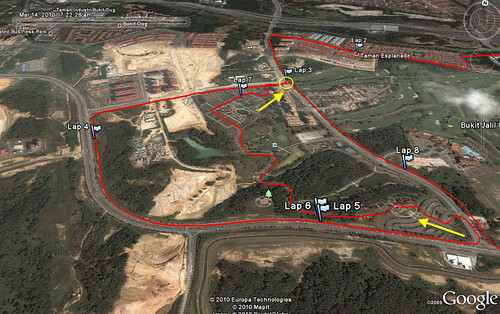 The race being held at Bukit Jalil was another added convenience as it’s only 10-15 min away from our place. Bareno (http://www.bareno.com.my/) as a manufacturer of bathroom and kitchen appliances is a rather odd sponsor/organizer for road races. I suppose it’s a good marketing approach for them as they’ll be able to reach out to a large number of people fairly quickly. 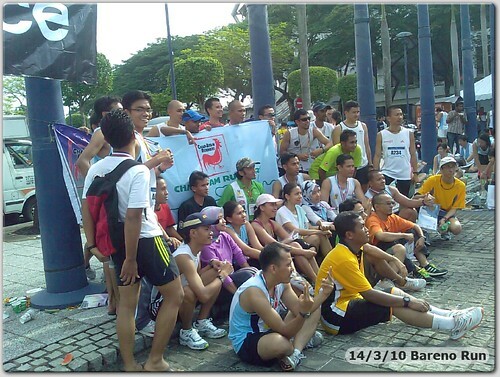 Since Bareno’s core competence is not likely in organizing running events, they did the right thing by partnering with Taman Bukit Jalil Running Club to organize this event which comprised three distance categories – 15K, 10K and 5K. Was done a day before the event at Bukit Jalil stadium. Went smoothly except for a minor hitch – they have ran out of size for waiyan’s t-shirt (she got an L-size instead of M). 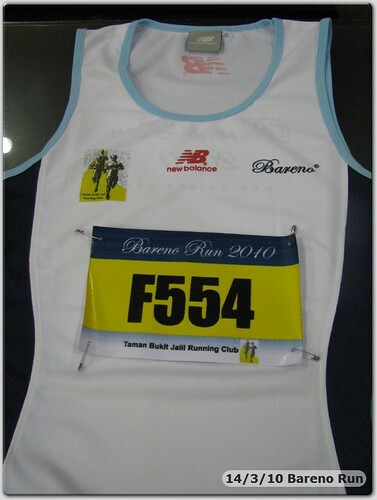 For 15K and 10K you get a New Balance running vest and for 5K you only get a t-shirt (also from NB). We were asked to select our vest/t-shirt size during registration – so again, you do feel disappointed when they couldn’t keep the sizes for you?!! 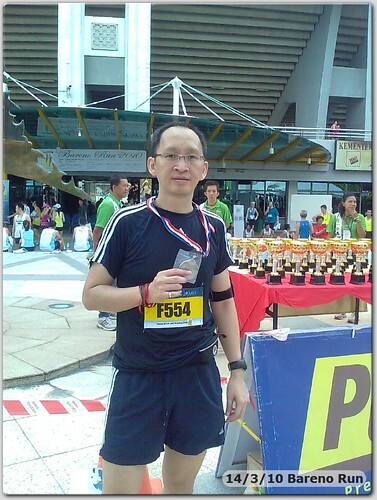 After getting the bib number “24” for the Putrajaya Night Run, I got another not-so-ong bib number again – this time I got “554”. But let’s not get too superstitious.. hehe. Slept early the night before – those who knew me, would know that being a “night” person, sleeping early is not something that comes naturally for me tsk tsk – so was well rested on the morning of the run itself. With Bukit Jalil being very near to our place, we did not have to rush ourselves. Took the usual “running breakfast” of cereal, soya, hard-boiled eggs and a powerbar…. and off we got ourselves into the car and within 15 min were already parked inside Bukit Jalil Nasional Stadium. It was still pitch dark when we got there… We can see some runners actually walking to the stadium. 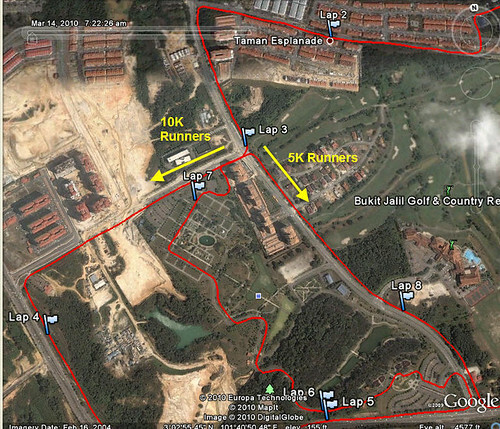 I guess these are the runners staying in the houses and condos around Bukit Jalil. 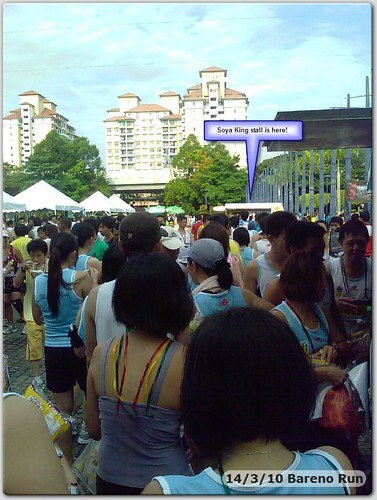 Did a 15-min warm-up, and we can see the organizers getting the 15K runners into the starting pen for flag-off. The MC even gave us a breakdown for the number of runners in each category. In total, they got about 2,800 runners and about 1,000+ of them were in the 10K category (male & female), with bulk in the 5K category. 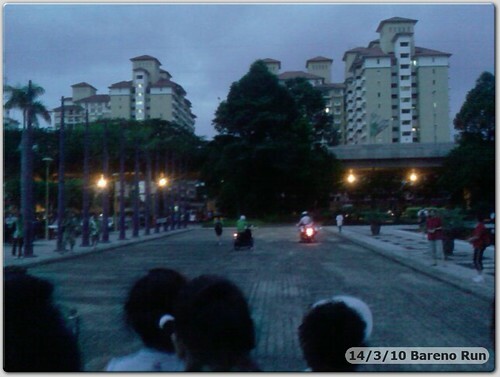 We were flagged off 5-min late (no big deal) and as soon as the “gun” went, everyone seemed to be rabbiting (ie. sprinting) straight off the mark! By the time I got into my stride, I think a couple hundreds of them must have sayured past me! So much for my grand scheme to get a good head start. LOL. The map above shows the 10K route, starting from the “green marker” at the right side of the map. Each Lap marks my 1K split. Once we exit the starting lane inside the Stadium, we turned left and ran along underneath the elevated KL-Putrajaya highway. 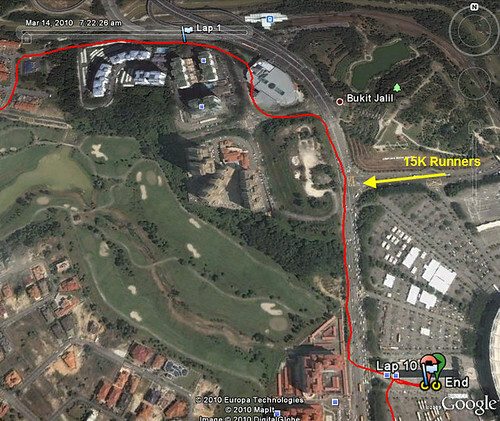 Not more than 0.5km from the starting, I can see some 15K runners joining us from the junction on our right. They were flagged off about 20 min earlier and would have completed about 4 – 5km of their run before they converged with our group. 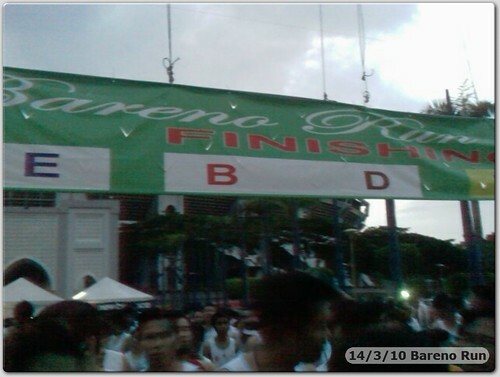 These early runners would obviously be the fast 15K runners as they would be running at faster than 5 min pace. I started off pretty well, maintained a 5:10 pace for the 1st two KMs before I hit the first – of many (sigh) – uphill slopes in this route! My initial target was a 5:45 pace, with a stretch target of 5:30 pace but the moment the slopes came up on me at around the 2km mark, memories of my Adidas King of the Road (KotR) DNF came flooding back, tsk tsk. I decided finishing this race would be more important to me than getting a good timing, and I adjusted my pace to tackle the slopes without zapping too much energy from me too soon. The positive thing about this route compared to KotR is that after each uphill slope, you do get a downhill respite (the yellow arrow in the map above). So far, we are running on the same route as the 5K runners (who were flagged off 15 minutes after us) and it’s not until the 3km mark where both the 10K and 15K runners were asked to turn right into one of the roads bordering the Taman Rekreasi Bukit Jalil, effectively breaking-off from the 5K runners. I was still maintaining below 6-min pace so far… as we went round the roads bordering the Rekreasi park. 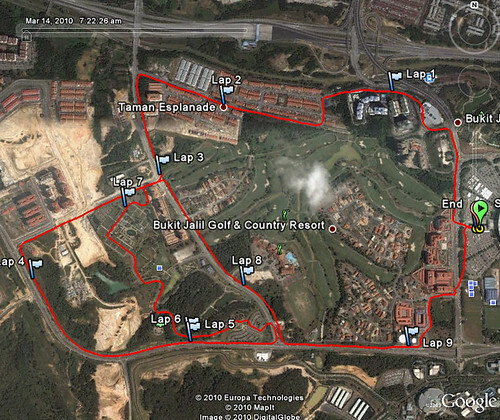 So far so good….. until we get diverted INTO the Taman Rekreasi Bukit Jalil around the 5.5km mark (see yellow arrow in the bottom-right of the map below)! haha.. this was where the killer hills FUN started! 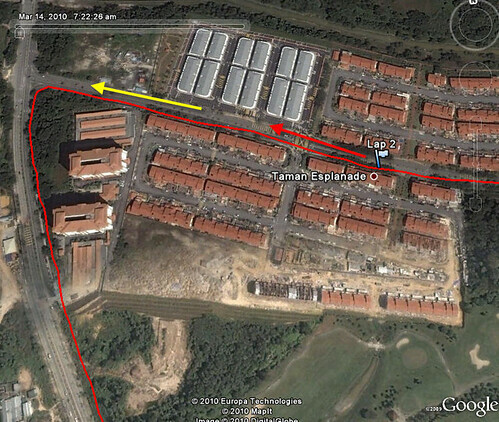 If you have ever jogged inside Taman Rekreasi, you would understand how “nice and gentle” the hilly trails are… LOL. One of my running buddy, Yimster regularly jogs/trains in this park and as I was huffing and puffing and trying not to die on the spot thru the trails, I was thinking how he must have been enjoying this part of the run! Having said that, there was a deep downhill slope as we exit the park so that again offered us a respite as we kinda race down the slope. It was quite steep though and I was mindful not to go too fast lest I actually rolled down instead. The exit took us back to the point where we were first separated from the 5K runners (ie. 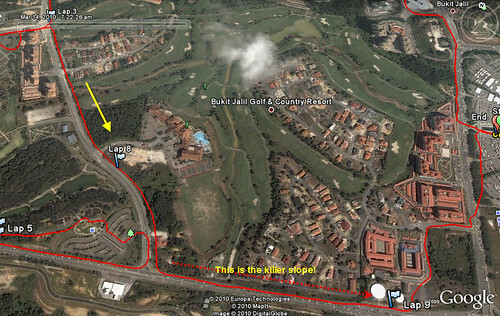 around 3km mark) and we then followed the road heading back towards the Bukit Jalil Highway. Some slopes here and there but after the Rekreasi Park, nothing much that fazed us now but my pace has now dropped to a 6:30 since the Rekreasi Park. haiz. 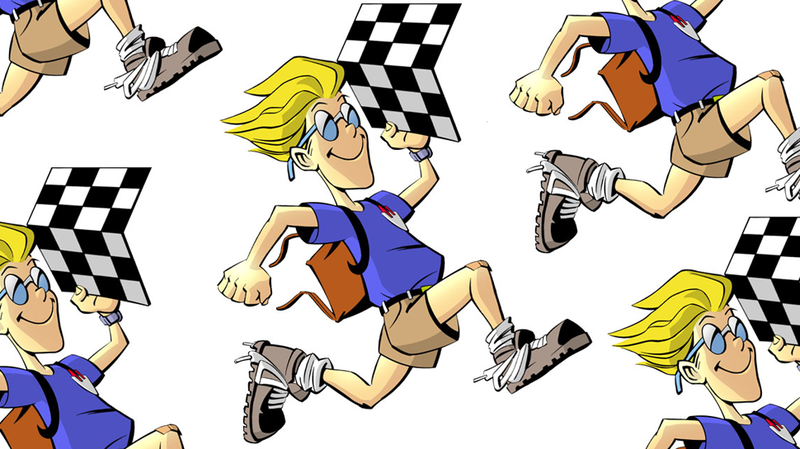 If you think it’s now a cruise back to the finishing line, remember they said the BEST is always saved for the last! hehe. As we exit the Rekreasi Park into the Bukit Jalil Highway, the BEST of the uphill slopes was right in front of us – a straight 800m uphill crawl along the highway! Grunting and wheezing my way along the climb, my pace dropped to a ponderous 7+ min pace and the road seemed never-ending….. was I imaging things or did the road get longer and steeper as we trudged forward? I finally gave in to the temptations to take a walking hike up the slope instead of jogging… walked for about 100m mainly to take a breather… and then reverted back to a jog as we finally reached the summit of that (whew) long steep road. I’ve to make a safety observation about this stretch of the route. We were running in the same direction as the traffic along the highway (ie. the cars were coming up behind us) and we only have the triangular traffic cones as a safety divider. Some of the slower runners were literally walking at this stage… and instead of walking one behind another, they were walking in a row across! So you can imagine if there’s a row of 3-4 runners walking slowly in front, you have to cut out to the right-most to overtake them and that’s when it can become dangerous! We now turned off the highway into the residential areas, and with the roof of the Bukit Jalil Nasional Stadium in sight, I realized we were very near to the finishing point. Time to pick up my pace for a good finish. At this moment, I do not even care about my timing… more than happy that I managed to complete this horrible hilly run without succumbing to a DNF. 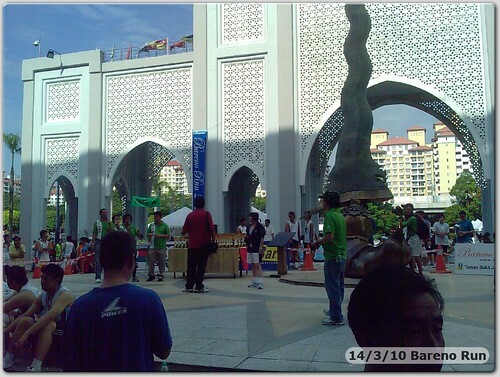 The prize-giving area in front of the Stadium’s main entrance. 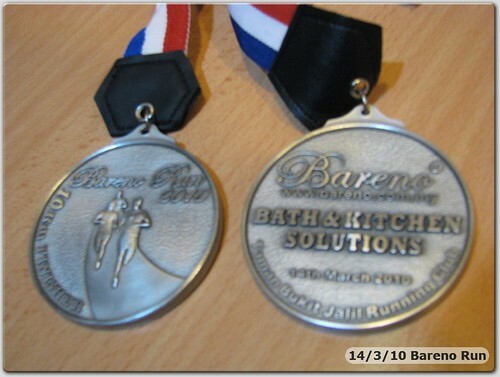 Bareno provided nice trophies for the elite runners. There were plenty of drinks, fruits and food for runners. The Milo & 100Plus stations were more than sufficient to cater for all the runners, and they even provided fresh watermelons which were so refreshingly cooling as the sun started to creep up on us. We noticed a long queue which we thought was for the ice cendol stall but later found out it lead to the Soya King stall. 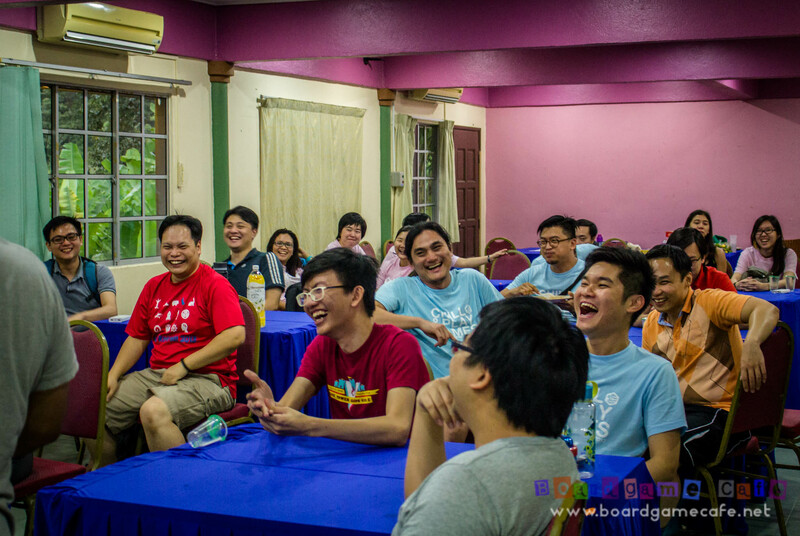 Hmm… tau foo far? Nice….. it’s a long queue though. Then again, you don’t say No to tau-foo-far.. LOL. The race itself was organized pretty well. Runners were efficiently ushered into the starting pens and flagged off timely, sufficient markers along the route to ensure no one got lost, enough water stations sprinkled along the route and a well channeled finishing lines. Some of the improvements could be better safety along the route especially when we were running at the highway stretch as we were running in the same direction with the traffic (meaning the cars were coming behind us) and we only have those triangular cones to keep us cordoned. The Finisher Medal is large.. close to 3″ in diameter and considering we got a medal and a nice NB running vest for RM35, it was a worthwhile run. Will certainly be back next year if they are still doing this.